About 10 years ago, Narayana Peesapaty was in the middle of an in-flight meal when he came up with an idea that he couldn’t get out of his head: what if you could have your spoon and eat it too? Not long after, he quit his job as a rural development researcher, sold his house to raise money for his endeavor- and Bakeys was born. 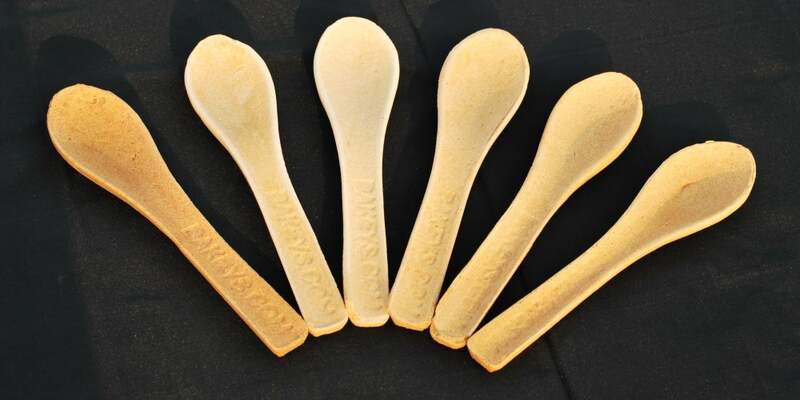 The startup, which is based in Hyderabad, India, produces nutritious and affordable edible spoons, an eco-friendly alternative to the disposable plastic spoons, forks and knives that cover landfills all over the world. In India, 33.7 million tons of plastic waste is produced daily. Bakeys is one of a number of innovative businesses addressing the issue of plastic waste and promoting a culture of conservation. To further its environmental mission, Bakeys also aims to conserve water through the cultivation of millet, a group of highly variable small-seeded grasses, widely grown around the world as cereal crops or grains. Currently, about one-third of India’s farmland is devoted to growing rice, a water-intensive crop that places a huge strain on the country’s groundwater resources. The millet used in Bakeys’ spoons, however, requires 60 times less water to grow. This makes it a significantly more sustainable agricultural option as fresh water continues to grow scarce in many places worldwide. “This is the future and we’re going to save the soil, groundwater and protect health with this product,” Pradnya Keskar, Peesapaty’s wife and business partner, told The Venture. Bakeys’s spoons are organic, vegan and kosher. They are made from rice, wheat, and sorghum flours, with no chemicals or preservatives added. And the spoons, which have a shelf life of about two years, come in three flavors: plain, sweet and savory. When you’re done using the spoon, you can either eat it or leave it to compost. The spoons are safe for insects and animals to eat, and it takes them just a few days to degrade naturally. Keskar said the company’s first big customer was a luxury hotel chain. Today the clientele has grown to include a hospital, coffee shops, offices, organic food stores and individual families. Bakeys has shipped to 12 countries around the world, and its reach has expanded significantly in the last year, particularly in the United States and the United Kingdom. Each spoon costs 2 Indian rupees, or 3 cents. Despite recent growth, Bakeys is still a relatively small operation. Keskar and Peesapaty run the business with the help of a few friends who volunteer their services. An all-female staff is responsible for producing the spoons, which is noteworthy in India where financial independence can be difficult for women to achieve. Bakeys’ ethical practices and green product have struck a chord with consumers worldwide. The company ran a successful Kickstarter campaign that raised $278,874 USD, well surpassing its goal of $20,000. Currently, Bakeys is expanding from a manual to an automatic production system, which could support considerable growth. Keskar is also optimistic that an increase in bulk orders will allow Bakeys to reduce its price to 1 rupee per spoon. “We need to get really geared up with technology, automation, packing design and logistic services,” she says. Bakeys has made prototypes of forks, chopsticks, dessert spoons and soup spoons. It also has plans to create taster spoons, coffee stirrers, toothpicks and maybe even Popsicle sticks. Though Keskar believes that offering an affordable price is the most important factor when it comes to growing Bakeys’ business, the continued push toward green practices in India and around the world keeps them motivated. First published by Chivas The Venture on http://www.chivas.com/en-gb/the-venture.